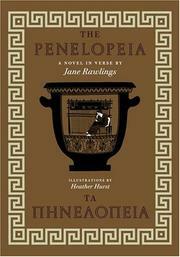 A debut novel (in verse, no less) by poet and archivist Rawlings, who takes up where the Odyssey leaves off and tells things from Penelope’s point of view. When Odysseus finally gets home to Penelope after the Trojan War, the reunion, in Homer’s version, is a joyful one, naturally. In Rawlings’s account, however, it contains an extra surprise (or two) that Homer never included: namely, twin daughters whom Odysseus has never met before. The girls, Nerianne and Ailanthis, were born not long after Odysseus left for the war, and they’re now young women of astonishing beauty, possessed also of exceptional grace and insight. Their mother, solicitous of their futures, wants to know what fate holds in store for them so that they may live in peace and contentment—and the best way to find out is to consult an oracle. Odysseus is reluctant to let them go, but when his son Telemachos is badly injured in a hunting accident, he consents and agrees to a pilgrimage on behalf of his son as well as his daughters. So Penelope sets off with Nerianne, Ailanthus, and some of their devoted retainers on a journey to the oracle of Pytho. The trip becomes a mirror image of Odysseus’s wanderings in the Odyssey, mother and daughters battling through a variety of hardships (not the least being an attack of Amazons) in order to attain their quest, propitiate the gods, and save the honor of their house. And they return to Ithaka in the end, showing that epic quests can have heroines as well as heroes. In spite of the obvious and hardly original gender-bending, this is quite a good take on Homer, cleverly conceived and nicely written in noble cadences that are intentionally (and accurately) reminiscent of Lattimore’s Homeric translations.